The radiator thermostat has given millions of people control of the heating in their home. Danfoss’ iconic invention is turning 75 – more relevant than ever. In 1943, the founder of Danfoss, Mads Clausen, invented the world’s first radiator thermostat. Seventy-five years later, the iconic product is more relevant than ever in a world trying to control the temperature. In Europe alone, there are over 500 million radiators with manual and unregulated valves. If you installed radiator thermostats on them all, Europeans could save 12 billion euro and 130 TWh of energy every year. The upgrade would reduce Europe’s annual CO2 emissions by 29 billion tons – and the investment would pay for itself in just two years. That is according to a report from the European Building Automation Controls Association. We are all familiar with them – maybe you even have one in your home. The radiator thermostat is Danfoss’ DNA and the most visible evidence that our technologies help the world do more – with less. “The first prototype of the world’s first radiator thermostat was tested in my father’s office. It was the birth of the world’s first thermostatic valve for controlling the temperature in a room. The actual marketing began in 1952, when the radiator thermostat was launched as a device that saves money and makes centrally heated rooms more comfortable, and from there on it just took off,” recounts Jørgen Mads Clausen, Chairman of the Board at Danfoss. The product was patented and gave Danfoss a leading position when the company began mass production of the radiator thermostat. 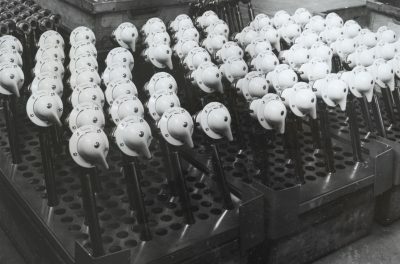 Since 1943, approximately 350 million have rolled off Danfoss’ production line. The latest version is the intelligent radiator thermostat Danfoss Eco™ – which has won the prestigious design awards Ret Dot and Danish Design Award. “It is a strength for Danfoss to have been on the market for so many years, and there is an abundance of Danfoss DNA and cultural heritage in even our brand new electronic thermostats. Mads Clausen developed the leading technology in the temperature regulation and the intuitive turning motion of the thermostat that makes it so easy to use. That knowledge and technology have now been incorporated in all our new electronic thermostats. That way we keep up with trends in line with consumers’ wishes,” explains Anders Barkholt, Vice President of Danfoss Radiator Thermostats.